Are you looking for a new way to take care of your skin? You should try dry skin brushing. It is a simple and effective way to take care of your skin naturally. Take a minute to stop and think, and it will make sense. We brush our teeth everyday, we brush our hair everyday, so why not brush our skin on a daily basis? While it might not be incredibly popular, dry skin brushing is an age-old process of brushing skin with a natural brush to improve circulation, stimulate lymph flow, exfoliate skin and help cellulite. Let’s get down to basics. Dry skin brushing is literally what is sounds like. You strip down to your birthday suit right before you are about to take a shower or bath, and take a natural brush to your skin. To do it right, start at the feet and hands and brush the skin towards the chest and heart. Dry skin brushing feels really great, and it will make your skin silky smooth. 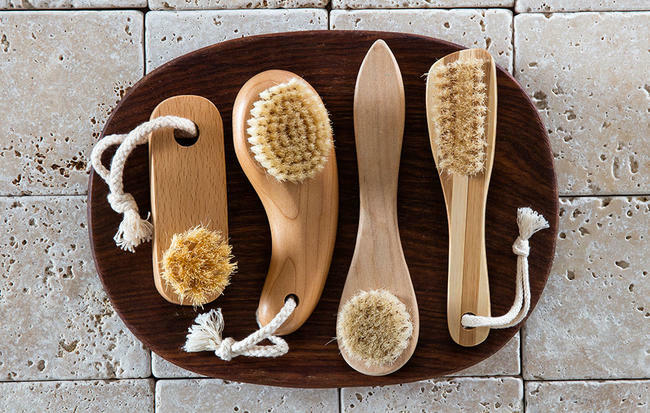 In addition to having softer skin, dry skin brushing offers other health benefits, too. For example, dry skin brushing gives great lymphatic support. Did you know that the lymphatic system is a huge part of the body’s immune system? So, many of our lymph vessels run just below the skin. Advocates of dry skin brushing state that brushing the skin daily will help to stimulate the normal lymph flow within the body, which in turn will help the body detoxify itself naturally. Sounds great, don’t you think? Another perk is that dry skin brushing is one of the simplest and most natural ways to exfoliate the skin. Exfoliating helps loosen and remove dry skin cells, and this benefit is one that is sure to be noticed after the first time you dry brush your skin. Your skin will feel much softer, and let’s be honest, we all like having smooth, silky skin! When the skin is exfoliated, oil, dirt and residue are cleared from its pores. When toxins and debris are removed from the pores, they shrink and appear less visible than before. Plus, dry skin brushing also helps to cut down on the oiliness of skin. Additionally, many people proclaim that dry skin brushing has helped cellulite patches on their skin appear smoother. Dry skin brushing is a great, natural body detox. We recommend brushing your skin every morning as it is sure to give you a real energy boost. Dry skin brushing increases circulation which, in theory, can also increase energy. Plus, it only takes a few minutes. It’s a great addition to any morning routine as dry skin brushing is a natural, effective way to take care of the skin. We love it so much for the burst of energy and smoother skin. There are a few things to remember for the first time you decide to dry brush your skin. Firstly, make sure you choose a brush with a firm, natural bristle. We like a brush with a long handle as it allows us to reach our entire backs and brush the backs of our legs easily. While dry skin brushing can be done daily, you have to remember not to brush too hard! Start with soft pressure, as you can always work up to a firmer brush and more firm pressure over time. It is important to note that dry skin brushing should never hurt! A good rule of thumb is to remember to brush the skin toward the center of the body, so if you start with your feet or hands make sure that you are moving the brush in a motion towards your chest or heart. When it comes to the stomach and armpits, brush lightly in a circular, clockwise motion. Have you ever tried dry skin brushing? What did you think of it? If you are interested in learning more about natural ways to detox the body and remedy health issues, contact Santosa Detox & Wellness Center. Simply fill out the inquiry form below and a member of staff will get back to you. Santosa is a state of the art detox retreat on tropical Phuket, Thailand. We look forward to helping you in your journey to a healthier, happier life.